The Mcusta Higo-Trad takes the traditional Higonokami slip joint and elevates and refines it into a modern, performance piece without loosing the simplicity or utility of the original. It opens via the same exposed tang lever but the steel liner construction contains spring detents for smooth and secure operation. Add to that a San Mai VG10 blade and durable, gorgeous Staminawood handles and you have an elegant gentleman's folder that has classic style with contemporary execution. Brand new directly from Mcusta Knives. Blade: Crafted from San Mai clad VG-10 stainless steel, the drop point blade has a nearly full flat grind for excellent slicing and piercing performance while retaining good durability. It opens smoothly on Teflon washers via the exposed blade tang lever and is held open and closed by spring tension detent balls in the handle. The San Mai clad gives each blade a unique, wavy Hamon design for a striking visual appeal. Handle: Stainless steel liners support handsome, contoured Black and Green Staminawood handle scales with a central milled channel for traction. The open back construction keeps the Higo-Trad light weight and easy to clean and maintain. A Green cord lanyard is attached to the rear handle pillar to facilitate drawing the knife from the pocket. 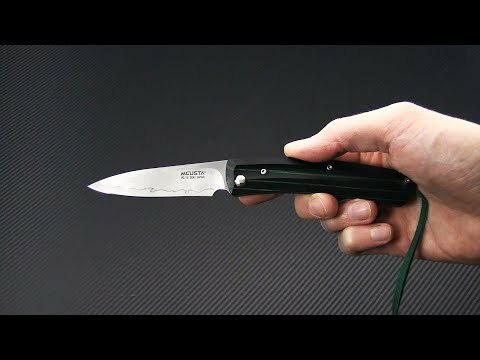 Tuck it into a pocket or pouch for carry, this knife maintains clean lines on both sides of the handle by having no pocket clip. San Mai clad VG10: VG-10 is a high-carbon stainless steel that takes a very good edge and holds it well. Popular with Japanese kitchen knife makers it is often hardened to 60-61 HRC A popular choice for small pocket knives thanks to good edge holding and stain resistance VG10 works well with a high polished, acute edge for optimal slicing performance. The San Mai cladding enhances durability as well as providing a unique visual appeal.